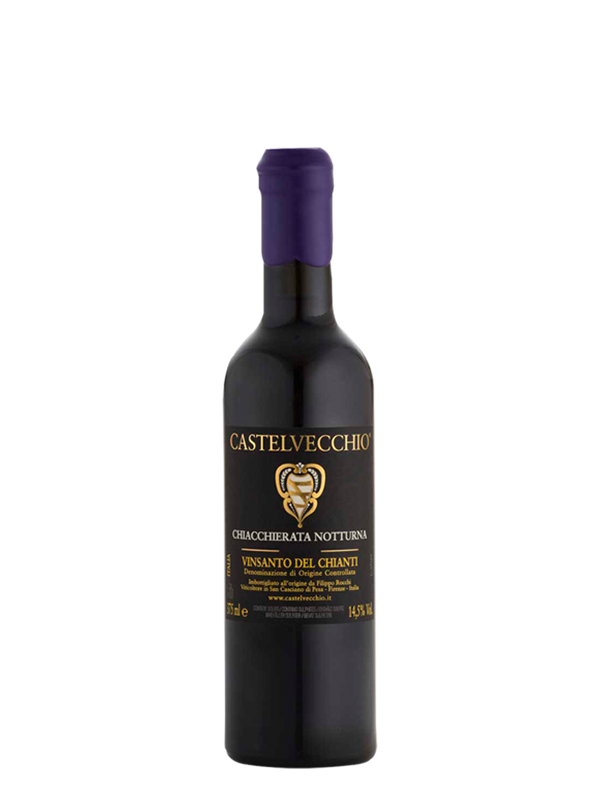 It is an exclusive and unique product as every producer has his own wine making recipe.Since harvest 2003 Castelvecchio’s Vinsanto is made from a selection of white grapes and red grapes.In line with the ancient tradition, the best bunches of grapes are selected by hand in September and left to dry in an appropriate room until December/January producing an harmonious must with a high sugar concentration. Aging in small kegs (caratelli) for at least 5 years and further refinement in bottle. This wine is the result of constant engagement in the first stage of the selection of the grapes and the patient dedication at every stage of the winemaking. For this reason this wine is produced only in particular years. A story to tell: three people sitting at the table, it is late at night, all is quiet around, but they continue to chat nicely while enjoying the new Vinsanto ready to be bottled, it brings up memories and the bottle ends up slowly … Chatting in a sweet night! Trebbiano 70% and Sangiovese 30%. BOUQUET: Intensely perfumed with oxidized aroma’s that recall dried fruits, hints of chocolate, honey and slight enamel paint. TASTE: Moderately sweet and intense, harmoniously blended, intense and soft.